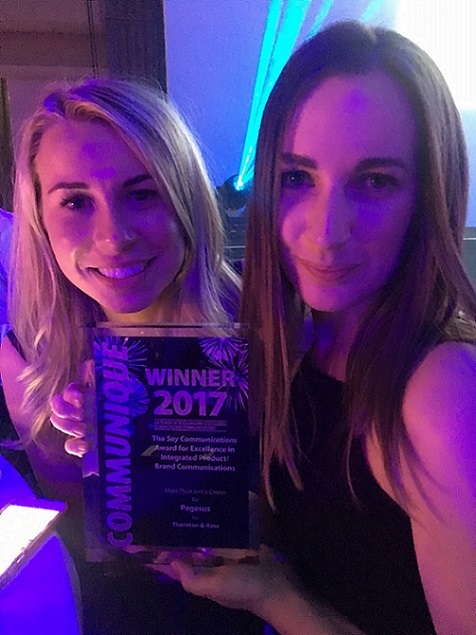 Pegasus, an Ashfield company, part of UDG Healthcare plc, is delighted to have won the Excellence In Integrated Product/Brand Communications award at the 2017 Communiqué awards for its work with Thornton & Ross’s Cetraben ‘More Than Just a Cream’ campaign. Using a creative activation theme of ‘Improve your SKIN-telligence’, Pegasus launched an insightful and integrated campaign that positioned Cetraben (an emollient) as an enabler brand. The campaign encompassed social, PR and digital to help make Cetraben the fastest growing brand in its market for two consecutive years, outperforming all competitors by some margin to achieve sales that far exceeded targets. Pegasus won the award by focusing beyond the Cetraben brand. It took the bold step to help first, sell later, creating an emotional connection with its target audience by acting as a caring, authoritative brand that is genuinely helping to improve the lives of people with problematic skin. Fixed on its course to inspire healthy decisions through creative integrated communications, Pegasus has built a team of 110 people working with a ‘health first, sector second’ approach. The agency’s capability now spans research & insights, strategic planning, media & influencer relations, creative services, digital & social marketing and corporate services. The 2017 Communiqué awards is a significant milestone for Pegasus; marking its fifth consecutive year being a finalist, highly commended or winner of the hotly contested Consultancy of the Year award.